Overlooking the hazardous Manitou Passage where Lake Michigan and Grand Traverse Bay meet, Grand Traverse Light has guided sailors around the tip of the Leelanau Peninsula since 1852. The attractive lighthouse has survived the storms of northern Michigan, raids by pirates and even a ghostly visitor or two. As one of Michigan’s oldest lighthouses, its charm and history can be enjoyed at the museum on site. But there is no guarantee the resident ghost will make an appearance. Although now called Grand Traverse Light, the lighthouse has also been known as Cat’s Head Point Light and Northport Light. The original lighthouse no longer exists. 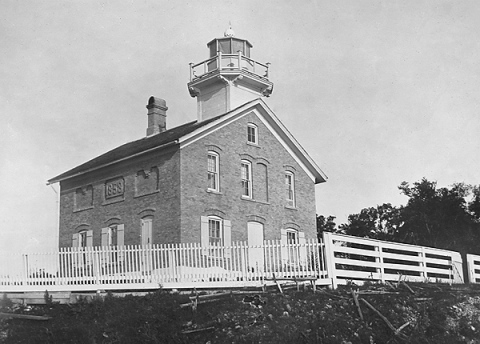 In 1850, Congress decided that the northern end of the 30-mile long Leelanau Peninsula needed a light station. After four thousand dollars had been earmarked for the project, President Millard Fillmore ordered a lighthouse to be constructed on the peninsula near Cat’s Head Point in 1851. The station consisted of a separate small keeper’s dwelling and a nearby conical brick tower. When it first went into operation in 1852, the lighthouse had a fixed light powered by a half-dozen lamps and reflectors. This was replaced in 1857 by a fourth order Fresnel lens. 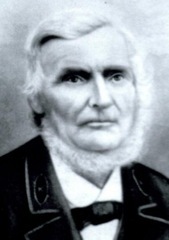 The first lighthouse keeper David Moon resigned after only one year. The second keeper was U.S. Deputy Marshall Philo Beers whose four-year assignment was unusually eventful. Pirates from nearby Beaver Island raided the lighthouse several times. These men were followers of James Jesse Strang, who had proclaimed himself king on Beaver Island. As members of an unorthodox Mormon community, the pirates felt justified in stealing from non-believers -- and what they wanted was the lighthouse’s Fresnel lens. However Beers successfully drove them off on more than one occasion. During Beers’ tenure, the brick tower and separate keeper’s house were judged unsatisfactory and both buildings were razed in 1858. The present lighthouse was built that same year, but at a location slightly west of the original tower. Constructed of Milwaukee cream city brick, iron and wood, the new lighthouse boasted a fifth order Fresnel lens. A nine-sided tower crowned the slate roof of the two-and-a-half story house. When the new lighthouse was first lit in 1858, Beers had already resigned as keeper. However the following year his son Henry took on the post, and served at the station until 1861. Nine years later, an upgraded fourth order Barbier and Finestre lens replaced the station’s fifth order Fresnel. Various renovations took place in the 1880s and 90s. In 1895 the Lighthouse Board asked Congress to allocate funds for a fog signal to be built roughly 140 feet from the lighthouse. Four years later, construction was finally completed on a brick fog signal building installed with ten-inch steam whistles. Since the steam whistles required a steady flow of water, a nearby well had to be sunk. The fog signal building increased the responsibilities of the keeper, and an assistant keeper was hired in 1900. This in turn led to apartments being added to the lighthouse keeper’s dwelling. Audible even eight miles away at Northport, the fog signal saw its greatest activity in 1904, operating for over 318 hours that year. The steam whistle was subsequently replaced in 1933 by a diesel powered air diaphone. Electrified in 1950, the lighthouse was deactivated in 1972, and its lightkeeping function transferred to an automated beacon placed on a skeleton tower. In 1984, concerned citizens worked to restore the abandoned lighthouse and keepers’ dwelling. 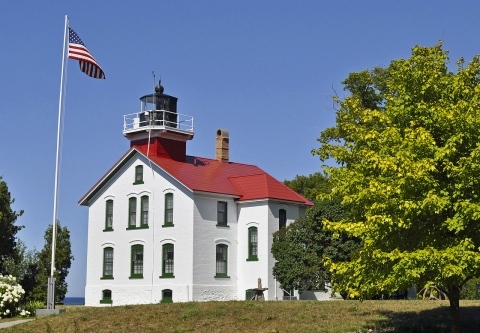 The organization became known as the Grand Traverse Lighthouse Museum and their efforts paid off when part of the site opened to the public in 1986. 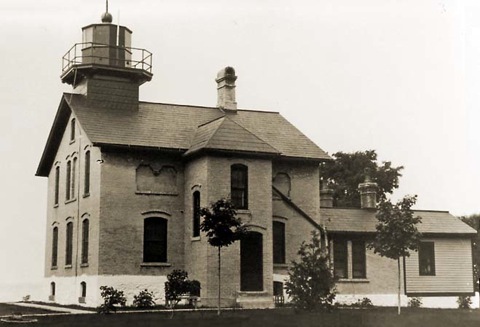 The decision was made to affix the fourth order Fresnel lens from Alpena’s lighthouse to Grand Traverse Light’s original pedestal. From 1852 to 1972, twenty men kept the light at Grand Traverse Lighthouse. One of these keepers was Captain Peter Nelson. Nelson served as keeper from 1874 to 1890, dying two years after he left his post at the age of 81. Some believe this former Danish ship captain still inhabits the lighthouse. Docent volunteers have claimed to experience such things as sensing a ghostly presence and actually seeing the figure of a man removing his boots. Others have heard voices as well as footsteps on the hardwood floor leading to the tower. Several years ago, a clairvoyant visitor to the museum swore that Captain Nelson appeared before her and spoke. Nelson is not the only candidate for this ghostly activity. Three people have died in the lighthouse, one of them Henry Schetterly, who kept the light from 1862 to 1873. John Marken had been lighthouse keeper at Grand Traverse for ten years when he and his wife were tragically killed in a Christmas Eve car accident in 1967. The museum does not normally publicize the ghostly rumors, but visitors can enjoy the supernatural aspect this October 19-20 when the lighthouse offers a special Halloween event for visitors. Along with hayrides, face painting and outdoor games, the more intrepid can explore the haunted basement. After this ghostly adventure, everyone will gather round the bonfire on Saturday night to enjoy s’mores, hot chocolate and a haunted story or two. Located in Leelanau State Park, the lighthouse is open daily May through Halloween; weekends only in November, although not the weekend of Thanksgiving. 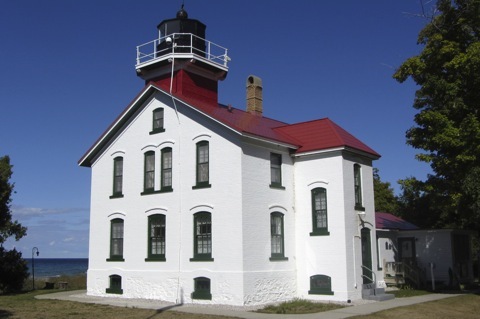 One of the most popular activities at Grand Traverse Light is the volunteer Lighthouse Keeper program, which runs April through December. This is a chance for lighthouse buffs to live for a week in the assistant keeper’s lodgings. While volunteers won’t have to tend the light, they are expected to greet visitors and perform various tasks on the grounds. The lighthouse is also available for weddings and other special events. And just in time for the holidays, Christmas 2013 should see the publication of the Grand Traverse Lighthouse Cookbook filled with recipes from former keepers, as well as fans of this well-loved Michigan lighthouse.